Disclosure: This post is brought to you by Ryboi Power Tools. Remember when I said my word for 2014 is FINISH? Well, I am happy to say I got another big project finally checked off my list! I finally finished the accent wall in Miss E’s new big girl rom and I am really loving how the room is coming together. Isn’t it the best feeling when your vision starts to take place? I still have a ways to go but here is a major sneak peek at how things are coming together. Today, I’m going to show you How To Install White Wood Plank Walls. Thanks to my Ryobi Cordless Brad Nailer, the job was SO easy. I mean seriously, anyone can do it and it’s really easy on the pocket-book too. 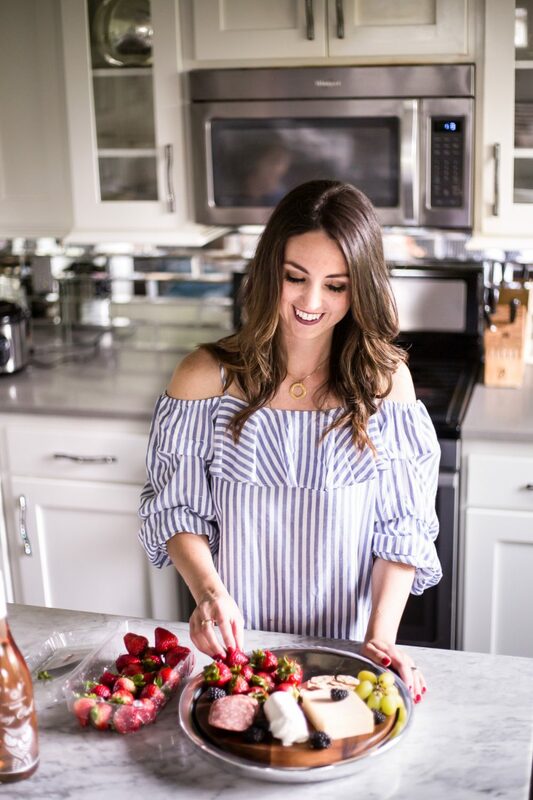 Whenever I do a complete room makeover I always start with a vision and then it tends to change 500 times between the time I start and the time I finish. And I’m sure it might change a little before I finish it too! But I’m loving the whole vibe that the room is taking on (you can view my inspiration here). With some toddler twists of course! P.S. I am really struggling with picking out decorative pillows for her bed. I don’t want to put too many pillows on there because I don’t want to cover up the headboard. But that little round one looks a little awkward. Seriously, I think this pillow situation has been the hardest part of her room so far, I’m not kidding. Who knew picking out a decorative pillow could be such task. I think I have something in mind, but do you have any suggestions? 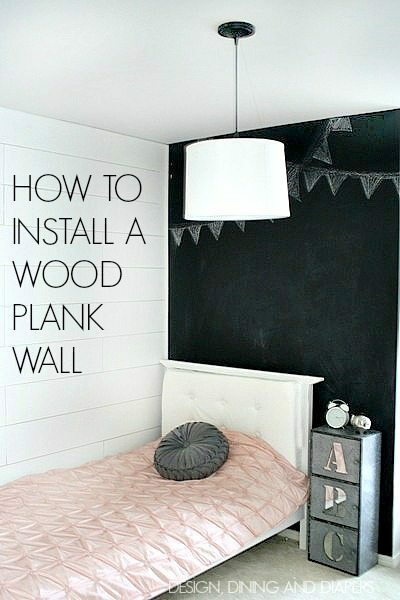 There are so many ways to install a wood plank wall. I did a lot of research and found several tutorials that were really helpful. I think House of Smith’s has one of the best so I’ll let you jump over there for some of the details. But I wanted to share my experience with you here. 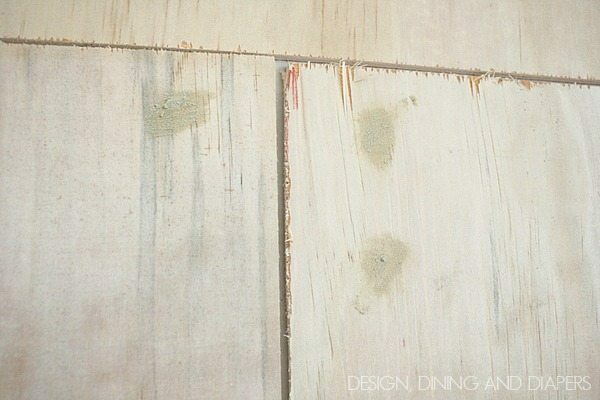 I started with 4 X 8′ pieces of ready to paint plywood and had Lowes cut them down to 8″ pieces. I went with a wider plank because I liked the look a little better than the more narrow pieces. My store always cuts my wood for free but I know some will charge you a few extra dollars. And unlike most tutorials I’ve seen, I chose to stagger my planks. I wanted a more pieced together look. If you look closely at the wall there is a pattern. I did two planks aligned to the left, two aligned right, and then two flesh to the all with a gap in the middle. Then I just cut pieces to fill in the gaps. It was a bit like piecing together a puzzle. I put up the planks using my Ryobi Cordless Nailer. On my word, this thing is amazing. I don’t know how I ever lived without it. No air compressor needed. This little thing is light weight, powerful and got the job done perfectly. And the best part, it’s quiet. 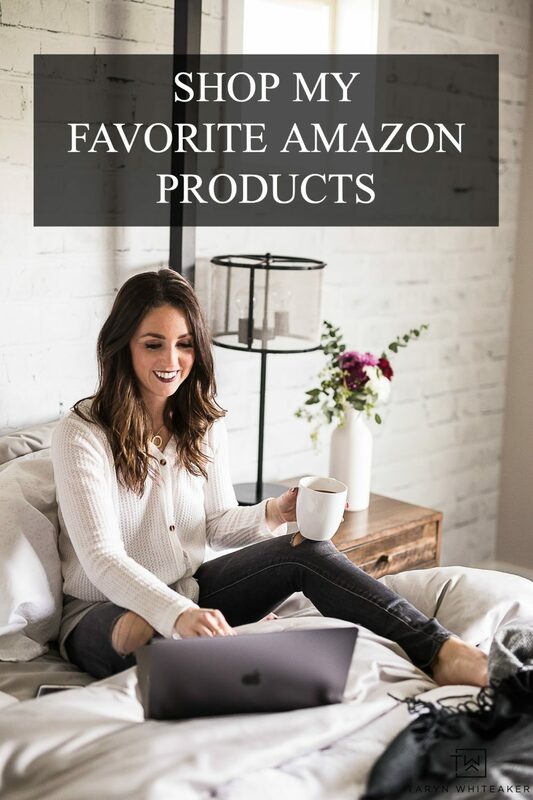 I can use this baby during nap time and my kids sleep right through it. If I can recommend one specialty tool to any of you, get this. If you plan on putting up molding, board and batten, plank walls, anything that needs brad nails then get this. It rocks my socks off. It is really easy to use. The nails are easy to load and you can adjust the settings to make the nails set further into the wood. After all the planks are up, I filled in the nail holes with sandable wood filler. I really suggest doing this and not skipping this step! Filling the holes makes a big difference. Then, I sanded the boards down and smoothed out the edges and the wood filler. I chose to paint the wood in Satin Dove White (primer + Paint) by Valspar. It took 4 coats to really get the coverage I wanted. Then I finished off the edges with quarter round molding. 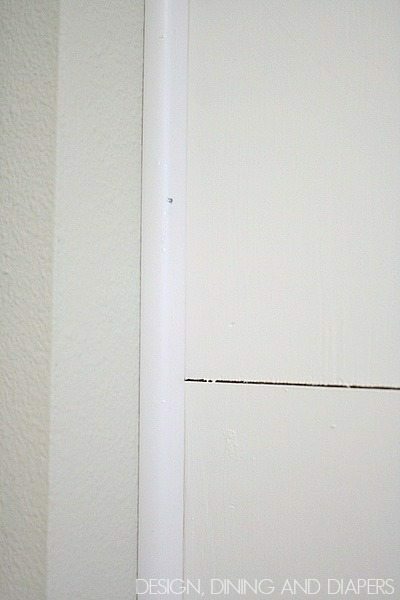 I also caulked around the edges of the baseboards and wood planks and the ceiling. 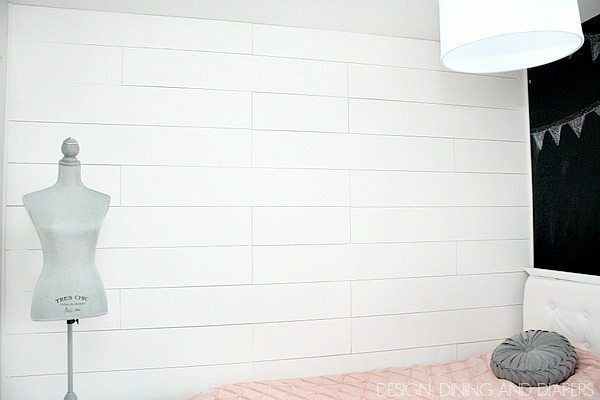 This wood plank wall really helped achieve the look I am going for in the room and I can’t wait to finish up this area! 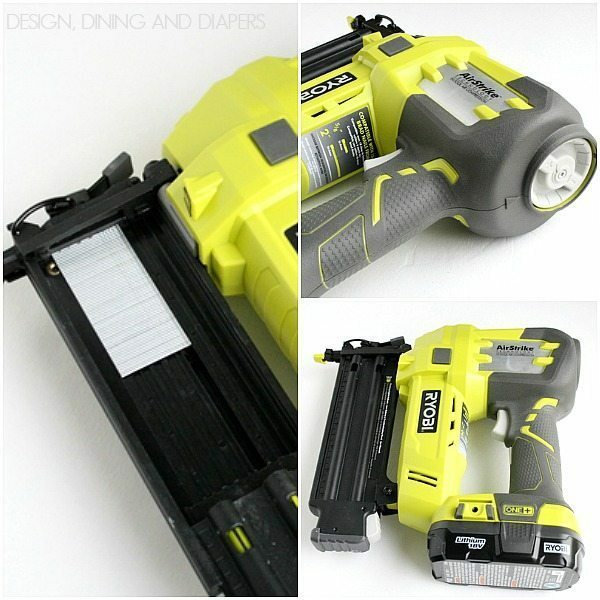 I am a huge fan of Ryobi Power Tools and you should be too! 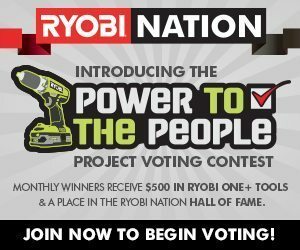 They have an awesome site called the Ryobi Nation where you can share YOUR DIY projects and get the chance to win Ryobi Power Tools! So head over and sign up and share your projects for a chance to win. I think a burlap sham and a crochet white/cream would add to the industrial glam feel you have going! :) Love it!! I LOVE it!! It is so beautiful and feminine, but with such unique industrial touches too. Can I move in?!? I am going to plank a room this year. Can’t decide. Boys’ bedroom. Kitchen. Both? Thanks for the tutorial and tips. Pinned. 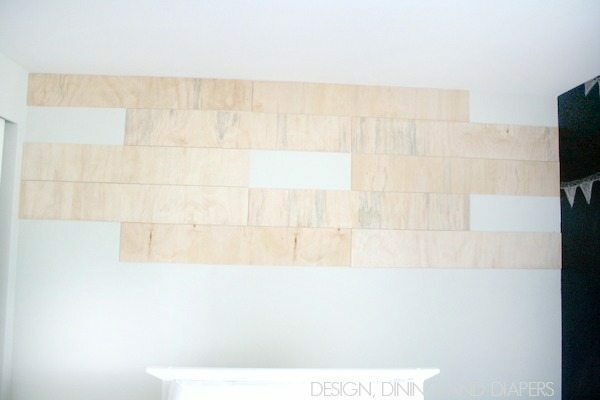 I’ve been wanting to tackle a wood plank wall SO bad! If only to find the time….Little Miss E’s room is coming along great! I love how that turned out, it looks great! I have the same problem with choosing pillows for my spare bedroom, I don’t want to cover up the headboard but I have one small round pillow on mine too that I also thought looked a little weird! I’ll be interested to see what you choose to do… and then I might copy you! lol! Love how your planked wall turned out! Her room is beautiful. The plank wall looks great. Love how her room is coming together! Love your wall! It’s hard to tell what thickness plywood you used? Is it the thinnest? like the kind used for subflooring? This is stunning, Taryn! And you make it look so easy! Pinning! Thanks so much for sharing! This room is stunning! My bedroom in our farmhouse was like this, of course at the time I hated it (because the other walls were papered) I LOVE that bedspread, all the elements are beautiful! This looks awesome Taryn! I love your word “finish.” I’m on a kick to finish projects all the way. I’d love for you to come link up at The Makers Link Party happening right now at TinySidekick.com. Hope to see you there! I love this look so much, I was about to plank a wall in my boys’ room when the Army decided to tell us to move :( I love the way yours turned out, gorgeous! This is one project on my To do list. Thanks for sharing. Pinning. That is one beautiful wall! Plywood! Who knew. The room is gorgeous and has so much more character! And that cordless nail gun? 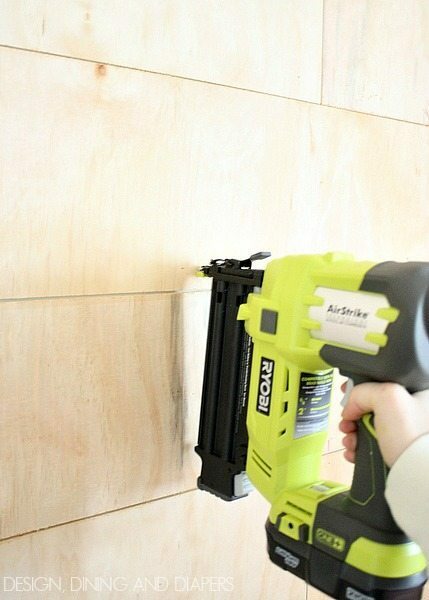 Dear Ryobi… this is genius. That wall with the adjoining chalkboard wall is magnificent! I love it!! nicely done Taryn … gorgeously captured. I too need to get my hands on some cordless nail gun action. ha! cheers. What size nails did you use in your brad nailer?